I use dBpoweramp to rip. It uses the Accuraterip database and C1 error reporting from the CD/DVD-ROM among other things to produce a precise copy of the music files. If it hits unreadable errors, it reports them as frame errors and it rereads them repeatedly at reduced speed until the data is obtained or not. The Baghiri disc (brand new, never played) had like 700 errors in the last track with no visible scratches. It slowed down more and more to read the errors but never could. I canceled the rip. The Robert Scott Thompson disc was unplayable and unrippable. I placed the Baghiri disc in my crappy home stereo CD player, and it seemed fine. My "beef": I am unable to archive and stream these unrippable songs through my new system that is designed to replace CDs. It may be debatable if that is a legitimate problem or not, but CDs may be going the way of vinyl because of their susceptibility to damage/poor manufacturing and because it is much "handier" to be able to dial up whatever music than to physically get a CD, put it in the player, and change it out at the end. Squeezebox (my music server) has allowed me to rediscover so much of my music because basically it's playing all the time now...without having to change CDs or change out a CD changer. I now have 37,000+ songs in .flac format on the hard drive of my music server. Two clinkers in one day. The 2 last tracks have multiple errors. It appears to have a paper label on it. The plastic has turned a bright yellow color. I've emailed Aucourant about a replacement. Jerry and I both broadcast our ambient stations from New Orleans for years without knowing each other. One day he was checking out my site and thought he recognized some pictures. He emailed and we chatted a few times. Subsequently we both survived Katrina but with significant life changes. I moved away in late 2006 and had not heard much from him. Lately I noticed that he had not updated his station in a bit. He will be missed as he no doubt looks down on us from an astral plane. I finally got a Blu-Ray player when I found one for $150 on Woot.com. I am converting my CD collection to .flac files for a home music server. A conventional CD player would not suit this purpose unfortunately. However, I will try the experiment and let you know. The player rips other discs quickly and reliably with dBpoweramp. I have two players in the computer in question and neither reads the last track. Both players are less than 2 months old. I know this is not fool-proof evidence of a good player but it's the best I can do. 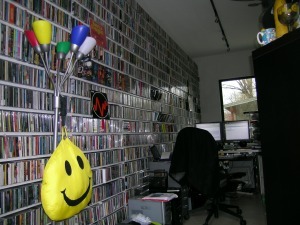 A CD-R this morning will not allow the last track to be read: Deep Chill Network - Dreams 4 - Why? Inspection of the CD-R reveals no damage. Is this some other problem with CD-Rs? The list of non-ripping CD-Rs is certain growing with only one CDDA no-go. My encouragement to try to avoid these things is also getting stronger. I got an email from another person that informed me that his copy of "Blind Cinema" had gone to pot also. You didn't see your own name? dBpoweramp put your name instead of "Rigel Orionis" as the folder name. using the name "jim brenholts" is enough to ruin your kharma for at least the next year. that is why i use a recording alias. Karma correction has been implemented at your request, sir. I consider you the boss of your own music. I clicked on the questionable folder name and took the trouble to type in Rigel Orionis. I feel much better now, and I know you do too. I just ran across another CD-R that gives multiple frame offset errors (24,000+) with dBpoweramp. I was able to rip it using WinAmp Pro but I suspect that the errors were included or skipped. Visual inspection of the disc reveals it to be pristine without dust, scratches or fingerprints. The score is 3 CD-Rs to 1 CDDA bad so far in my ripping adventures. In this day of digital downloads, I still prefer the CD. 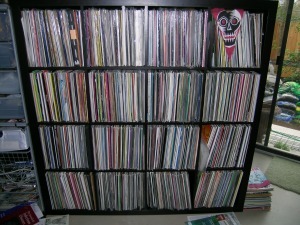 I like vinyl records, too. Each release includes a LOT of artwork. And the music is excellent too IMHO. I'm ripping the Robert Rich & Faryus release "Zerkalo" for my music server as I type this message. What other packaging has caught your attention lately? I've been trying to figure out how to contact Mr. Harris. I searched the forum using keyword "Harris" and came up empty except for my posts. Mr. Harris' website is not functional. If you have info on how to contact him, let me know. Aucourant who published his CDs is also working on the problem for me. Thanks for all the great comments and info. I have tried many drives for each of the "faded" discs with no luck. From now on when I get a CD-R, I will rip immediately, then place it in an opaque vacuum container, and store at -70 deg F in the basement where gamma radiation is less prevalent. I am also using dBpoweramp in secure mode. So far I have approximately 30,000 tracks ripped. By the way the Matthew J Harris disc was produced in 2001. So far I have not run across any unreadable regular CDs, but I remember an old Gothic disc I had that had the "CD rot" that was supposed to eat my whole collection someday. 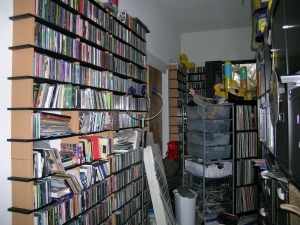 I have this ridiculously large collection of music on CD that I am ripping to .flac files for my music server. As the title says, I have run across at least 2 CD-Rs by ambient musicians that have deteriorated to the point of being unreadable by all the drives I have (4 CD players, 5 DVD-RWs, etc). There are a lot of musicians using CD-R now and hopefully those discs will retain the beautiful music as they should...or will they? One of my bad discs has been replaced by the musician. The other disc is apparently not replaceable as the disc is out of print (Michael J Harris: Blind Cinema). If anyone can give or sell me a copy of the latter I would appreciate it. I can email you a picture of me holding the disc and cover for proof. Anyway, musicians should consider shying away from releasing their "timeless" ambient music on CD-Rs that appear to be timed to deteriorate. You need to select "audio CD" format in Nero Burning ROM. Then drag the files to Nero or browse to them. I run http://zzzone.net which is a site devoted to ambient artists & music. 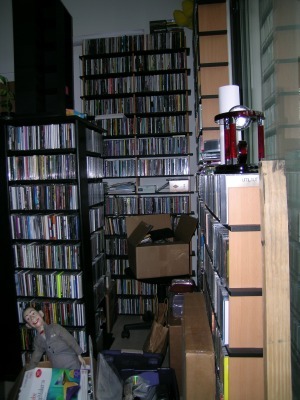 I recently moved to Austin and spent quite a bit of time unpacking and trying to organize my collection of antiquated optical discs.